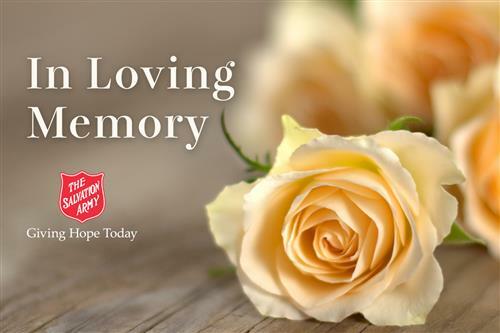 The Salvation Army's Remembrance Gift Program provides a special way to reach out to family and friends to express sympathy for the loss of a loved one, to extend get well wishes, or to remember someone on a special occasion, all while providing support for The Salvation Army's many programs. When your Remembrance Gift is received, The Salvation Army will immediately send a card to the person you designate, in your name, with a brief message expressing your sentiment. The amount of the gift is not mentioned and you will receive an acknowledgement of your tax-deductible gift. Your Remembrance Gift provides much needed financial support to help The Salvation Army in Buffalo carry on its mission: meeting human needs without discrimination. Make your Remembrance Gift online today!